Reflecting on her childhood, the writer Annie Dillard tells of how she hid pennies in trees and drew chalk arrows to lead passersby to their luck. Dillard would not linger to witness the pennies’ discovery, for to imagine that “chance” encounter was excitement enough. 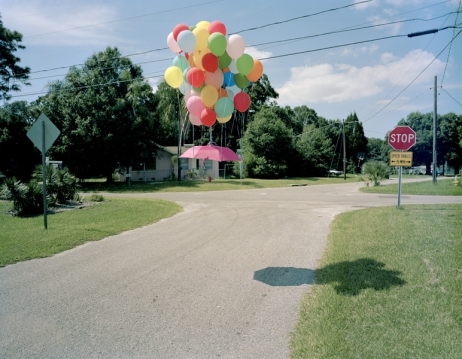 Like Dillard’s game, Adam Ekberg’s images encourage us to believe that the world still contains discoverable magic. His temporary object arrangements, composed of a few simple tools (fire, shadow, sunlight, mirrors, flashlights) and some party accessories (balloons, cocktail umbrellas, a mirrored disco ball, beer bottles), are riddles in light and matter, constructed, it seems, for a split-second’s pleasure. Against the backdrop of the interior of an old Vermont home, a Florida suburb, and a forest, Ekberg’s compositions picture the quasi-supernatural phenomena often seen only in our vision’s periphery: an evocative reflection or a curious shadow. The results are subtly but provocatively absurd. Ekberg captures wonder as it climaxes, on the cusp of fading. Many of Ekberg’s images, on view at Thomas Robertello through December 3, are about looking, and some thematize the camera itself, such as Arrangement #2, 2010, in which beams of light bounce off a network of mirrors in a dark hallway. In Shadow and Eye, 2010, the artist looks through the camera’s viewfinder and sees himself looking back through a hole in a fence. The camera is well-suited to representing the loop of self-referentiality. So what if every surprise has its logic, every trick its design; that does not reduce their wonder.